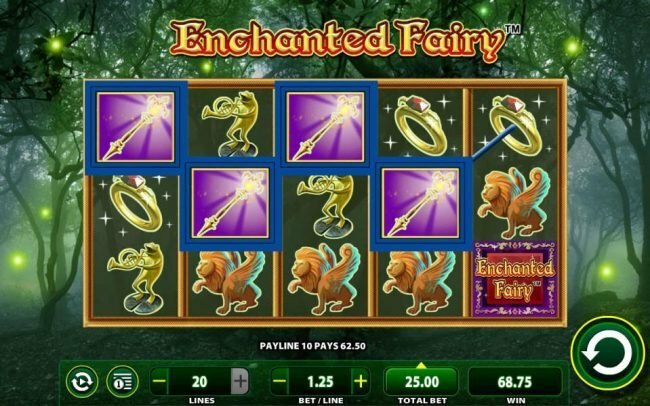 Enchanted Fairy slot machine using the whimsical creatures in a magical forest concept with 20 lines and 5 reels from WMS developers. 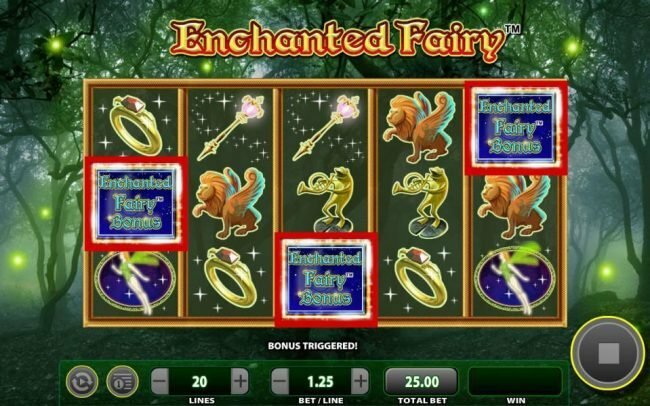 Enchanted Fairy Slots has not been reviewed yet, be the first to rate this slot. 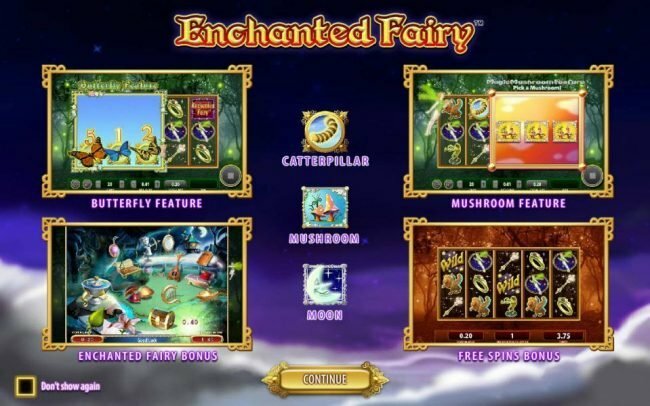 Enchanted Fairies is a wms developed video Slot that features all the magical powers presented by Fairies. The game comes with a ferry colourful theme, which is entertaining all on its own. 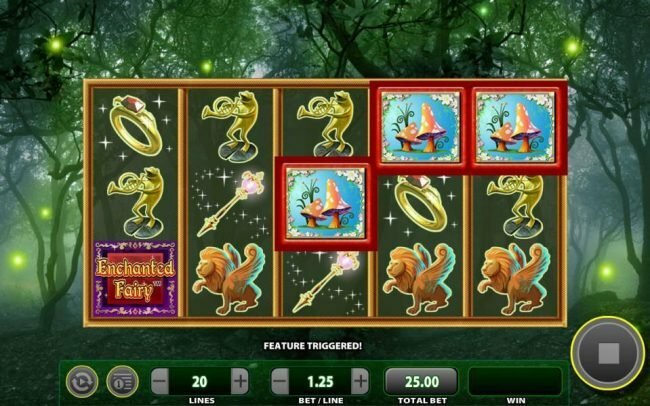 The game represents five reels and 20 pay lines that can complete combinations with every spin. Symbols need to line up from left to right and at least three of the same symbols are required for a combination to be completed. 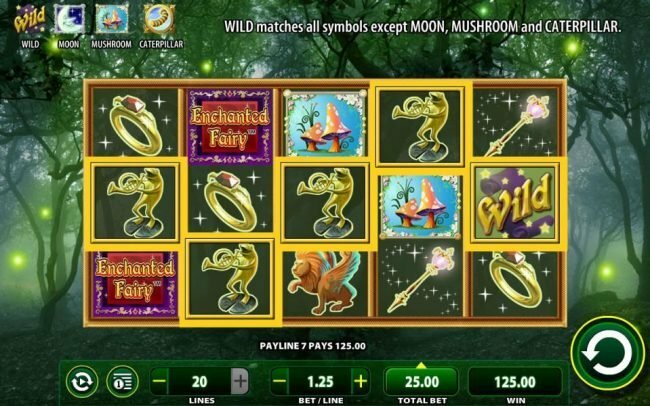 To help combinations appear more regularly wild symbols will be available and players can benefit from free spins and scatter symbols. 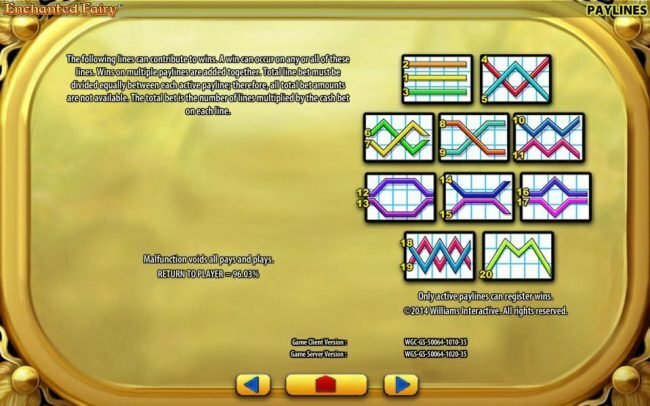 During the main game, a jackpot of 10,000 coins can be octane had when the right combination appears on all reels across a single line. The background of the game shows a dark forest with rays of light shining through. Among the misty trees green fireflies lighting up the reels and create quite a beautiful sight. The reels are presented in a golden frame with a darkened background to bring out the colour of the symbols on the reels. 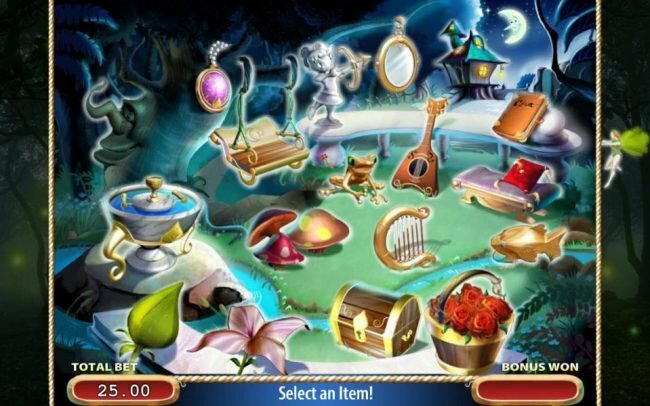 Players will find various animals and items on the reels that can only be found in a fairy tale world. 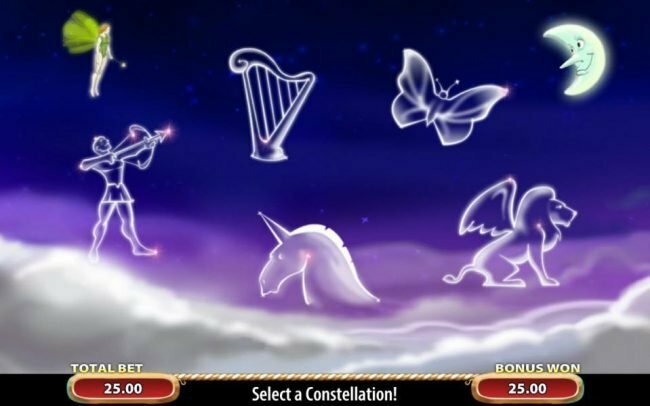 These include frogs playing a trumpet, golden wands, the fairy herself, Lions with wings and many more. 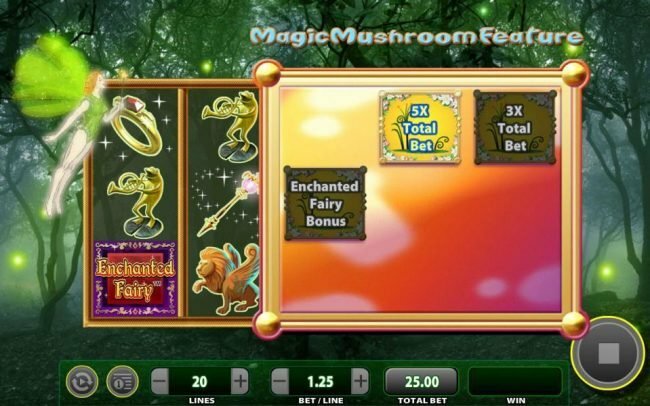 Betting options appear in a green box below the reels, which will be available between spins. Betting options allow you to take full control of the game as the number of lines are also adjustable. Select 1 to 20 pay lines for each spin, which could affect your winning opportunities, but also decrease your wager amount. 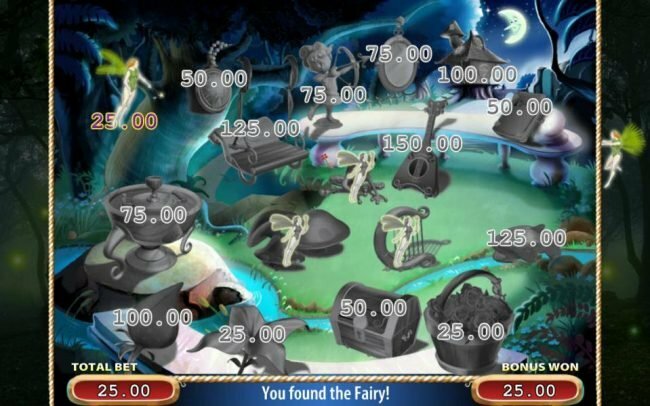 With all the lines activated a total of 20 coins will be needed per spin. 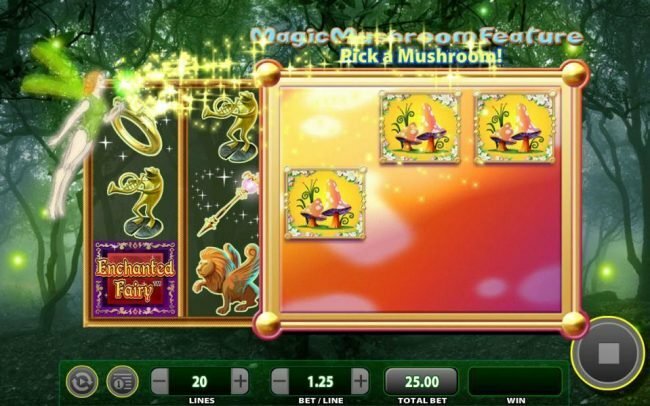 To the right of this option, players can select different coin values ranging from $0.01 up to $5.00 per line. 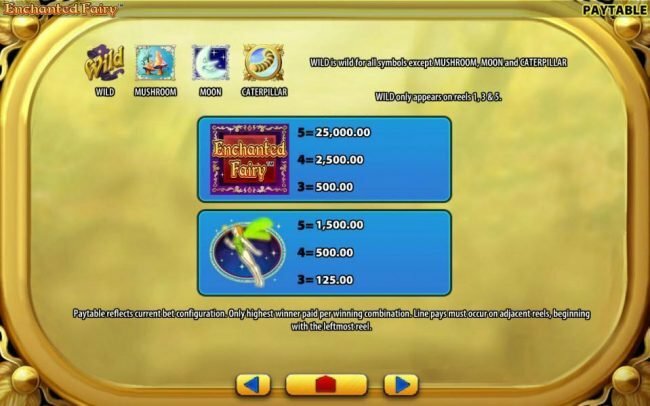 This presents a total wager up to $100 per spin. When using maximum bet, players will benefit from payouts up to 500 times higher than minimum bet. Bonus features include wild symbols that appear on any of the reels. 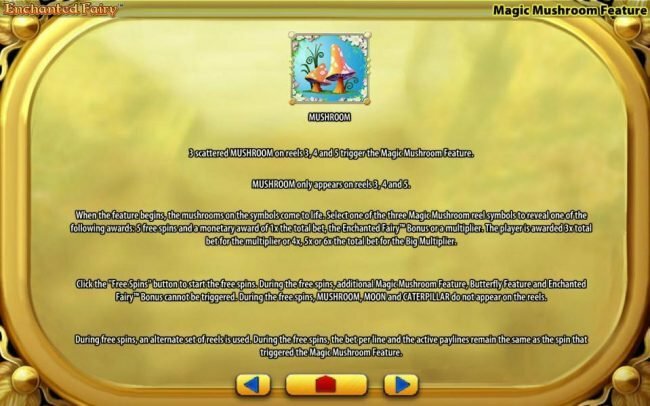 These are presented by the fairy herself and has the ability to complete various combinations. She can copy the value of other symbols and stand in as a missing symbol. 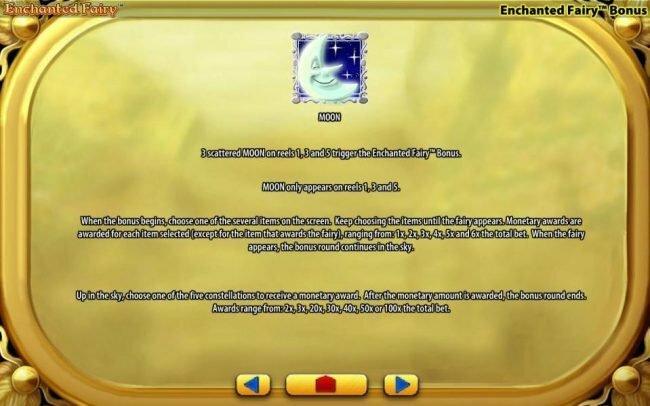 Only the scatters will not be able to use her features to activate their Bonus games. Scatter symbols show the game logo and appear on reels one, three and five. Get these to appear simultaneously to activate the free spin bonus feature. 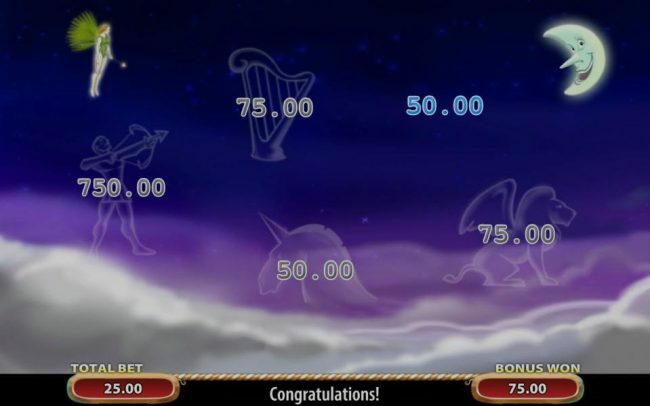 The game rewards 15 Free Spins and also includes a multiplier to double all the winnings you manage. 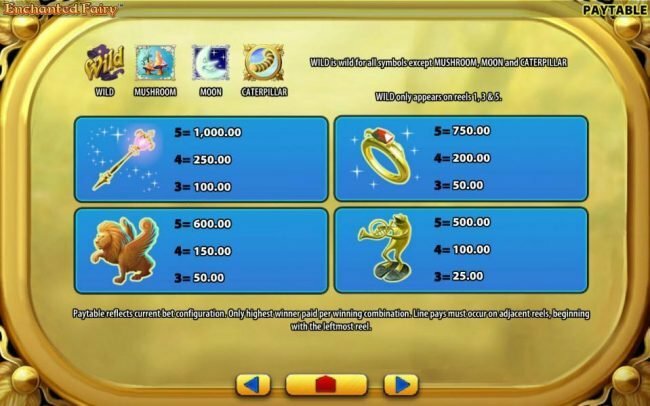 The reel set from the main game will be used during this feature, which means more winnings can be achieved with the wild symbols and players do have the ability to reactivate the bonus game. 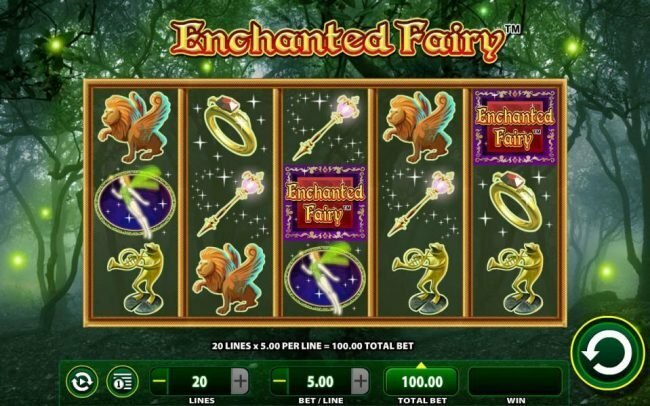 Enchanted Fairies is a game for all players can enjoy. The theme might look a bit girly at first, but this will completely be forgotten when the winning combinations start to line up. 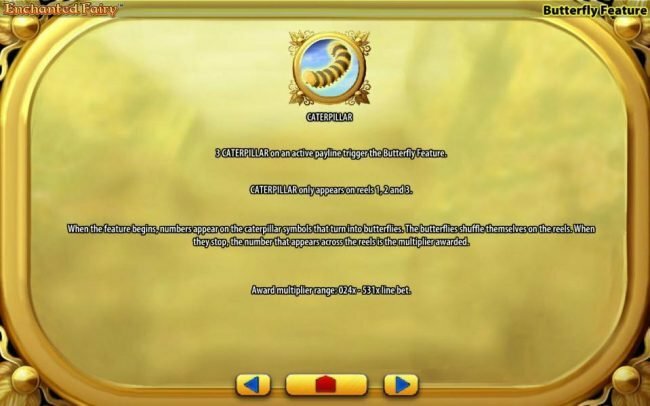 Activating the bonus feature is rather easy and offers some highly impressive rewards itself.